The sonorous, stately and uplifting strains of the heavenly hymn on Lord Dakshinamoorthy, the Eternal Guru soared above the 1,000 strong audience and harmoniously reverberated all round the majestic interior of the Shaikh Rashid Auditorium in Dubai, elevating the senses and the soul of all of those present that evening to a plane of undiluted tranquillity and deep contemplation. The rendition of this highly enlightening composition of Adi Shankara was marked by an immense depth of feeling, purity of notes, impeccable style and a refreshing vivaciousness and brilliance, all of which proclaimed the commendable calibre and competence of the artiste….an artiste none other than the exquisite and youthful Padmashri Smt. Sudha Raghunathan whose concert was held on Thursday 25th October 2007 under the patronage of the Consulate General of India, Dubai, by Indian Fine Arts, Dubai together with Indian Community Welfare Committee of Dubai as part of the ongoing 60th Indian Independence Day celebrations in the UAE. Ever smiling, charismatic and wonderfully articulate, Sudha is an interesting study of a rare and unique blend of traditional beauty, winning geniality, multifaceted talent and divine blessing, which was evident during the three hours of celestial magic and thrilling enchantment. 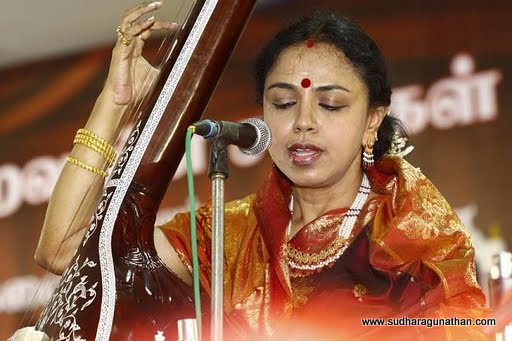 The oblation to the guru was followed by an intricate and rather elaborate varnam, ‘Maathe Malayadhwaja’ in raga Khamas dedicated to the Divine Mother, the ‘Dakshinamoorthy Roopini’ which was delivered with proficiency and exactitude, revealing glimpses of the enormous versatility of the artiste. The familiar and much loved kriti on the Wonder God Ganesha, ‘Vatapi Ganapathim’ in Hamsadwani was executed with consummate ease to a warm applause. The crest jewel of the Pancharatna kritis of Thyagaraja, ‘Entharo Mahanubhavulu’ in ‘Sri’ raga with its timeless appeal garnered the interest of all sections of the audience and was rendered majestically in impressive style. ‘Visalakshi’ in raga ‘Kasi Ramakriya’ with the accompanying swaram and thaniavarthanam was magnificent and truly spectacular. Sudha’s invincible mastery over the components of her music – the moods and nuances of the ragas, the combinations and complexities of swaras, the intricacies, minutiae and thematic correctness of talas was indeed phenomenal, revealing her superb legerdemain. A supremely stirring and poignant composition of Purandarasa, ‘Narayana Ninna Namada’ in Sudda Dhanyasi with deep undertones of humble entreaty was rendered in like spirit in a vibrant fashion which elicited spontaneous appreciation. Likewise, ‘Hari Smarane Maado’ in Yamuna Kalyani, the lyrics potent with sublime meaning and exhibiting shades of supplication indicating the pathway to Hari was delivered with great expertise and assurance. The vintage favourite ‘Bantu Reethi kolu’ a quick crisp number, was catchy and captivating. Nothing could be more endearing and delightful than the childish pranks and exploits of Natkhat Lala Krishna Kanhaiyya and so it was not surprising that heady feelings of ecstasy and elation pervaded the air as Sudha in her inimitable style, her countenance and body language giving vent to the exuberance which seemed to course through her, burst into a padam, ‘Vishamma Kara Kannan’ which brought a beatiful glow to the faces of her spectators (mirroring perhaps, the presence of ‘naughty, mischievous Kannan in each and everyone of us !!!!) and an irrepressible smile of genuine amusement to their lips ! The Ragam, Tanam, Pallavi, one of the much awaited highlights of any concert was beyond doubt, a veritable feast, not merely for those fortunate souls with a profound and deep rooted comprehension and understanding of the finer details of this classic art, but for ordinary folks too and for those of us blessed with a keen ear for music and the innate ability to appreciate and enjoy the same. With ‘Sri Krishna Ganam, Venu Ganam, Madura Ganam, in ‘Thodi’, Sudha, with amazing adroitness and a gay abandon wafted her audience on the enticing and irresistible waves of Bhakti to the hallowed and heart warming realms of Shyama Sundara Muralidhara through glimpses of such alluring and spell binding compositions like, ‘Kuzhaloodhi Manamellam’ ‘Asaindhadum Mayil Ondru’, ‘Pal Vadiyum Mugham’, ‘Alai Payudhe Kanna’ and ‘Thaye Yasodha’ in Kambodhi, Simmendra Madhyamam, Nattai Kurinji, Kanada and Thodi. It was an enriching experience………… simply out of this world! An exceedingly moving and appealing number, ‘Man ke Ankhe Kholo’ on Sai Baba, an earnest and impassioned plea to Baba, ardent and straight from the heart…….. brilliantly endeavouring to raise the human spirit from the quagmire of darkness and ignorance and imploring Him to help mankind wake up and emerge from the shadows of slumber into the lustre of his love and compassion, through the strands of entreaty and surrender, woven meticulously into the fabric of the song and all the while extolling the glory of Baba, was presented with a childlike simplicity and attachment. The electrifying silence in the auditorium for the duration of the song spoke volumes for the artiste’s superlative performance. The perennially popular Ragamalika ‘Kurai Ondrum Illai’ couched in simple language but laden with immeasurable devoutness and presented with deep fervour and explicit faith reached out to each and every heart in the audience, transporting them for a brief period to the Abode of ‘Malai Murthy Kannan’ to a state of total harmony, serenity and peacefulness. So powerful were the vibrations that for the period of the song and even long after, one were left with the wholesome feeling of being actually blessed and with nothing to ask the Lord for!!!! With this, Sudha moved on to a higher level with ‘Brahmam Okate’ a composition of Annamacharya, touching upon the metaphysical……. The Brahmam, Para Brahmam, moving on to the physical presence – Bhoo Devi and Venkateshwarlu, all the while reiterating in a tone of unquestionable finality the Oneness and Supremacy of the Ultimate Power. Sung in a lively and spirited mode and highly emotive – it drew a resounding ovation. In keeping with the spirit of the occasion, Sudha concluded her recital with a sparkling rendition of that priceless contribution of Bharathiar, ‘Vande Mataram’, a fitting finale to the evening’s scintillating performance. Sudha was ably accompanied by seasoned veterans on the violin by Sri Raghavendra Rao, on mridangam by Sri Neyveli Skanda Subramanium and on morsing by Sri R. Raman , who by their superb performance carried the concert to marvellous heights leaving the satisfied listeners in total admiration and in no doubt of their vast potential! It was undeniably an evening of soulful, lingering pleasantness, incalculably inspirational in content, enthralling in its richness and beauty and quietly healing with its divine impact. A musical moment in Time that will be savoured and remembered for aeons….